Average experience growth per season is about +-15, considering there is a 2 year difference, they are almost the same..Ability wise Cesar would be worse but I personally favour a different ability distribution so I don't think having 5 ability more is necessarily a better thing.. I don't want to continue the discussion any further because I don't want to reveal too much information..Managers with strong analitical skills figure those things out themselves over time and I'm sorry for those who don't..
Edit: just to point out - all coments above and on the deutsch topic are my opinion, not the ultimate truth and I might be wrong. I'd like to put everything to rest because there is no need to make a big thing out of it. I decided to completely change the strategy of my second team so Cesar is not that needed anymore. Even though I won't reduce the price because I don't need to sell him at any cost. on topic - congrats to Sebert once again, good job. My other comments were about "players who will never learn" and I stand by it...Even after so many seasons, some guys still make the same mistakes while buying players..No real plan or strategy..I guess the game needs many different players, even guys like that but that makes it a little less competitive than it could be.. 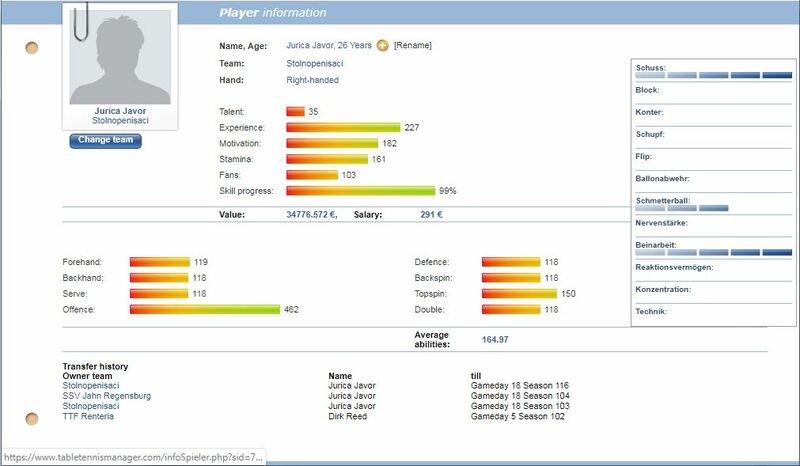 I just can't understand how someone is willing to pay 60-70k or more for a developing player that is already doomed at the age of 16-19..Even after seasons and seasons of careful development, with quite high costs, there isn't a guarantee that you'll get a real Bundesliga player, I'd say quite the opposite, there is a quarantee that most players won't be good enough because some mistakes (or was it intentional) were made in the development before that (main reason of the sale).. I could understand if there was a strategy of team reconstruction with some young guns coming out of your own "incubator" so you buy someone in between to get a better age ratio of the team, more balance for the future but usually it's not the reason. Are some managers still experimenting or just lack a deeper understanding of the game, I don't know, but I see too many "mistake buys" while there are better options on the market.. But like I said earlier too, we're all free to do as we please so all of this is just my "two cents", my opinion that is not important.. I wish you all the best, to enjoy the game as much as I do..
Was genau ist das Ziel Deines Beitrags? Leute belehren, die Du schon als unbelehrbar abgestempelt hast? Oder nur anderen das Geschäft nicht zu gönnen? und ich glaube nicht, dass es zu schwer ist, ein paar Dinge zu lernen und in Zukunft bessere Entscheidungen zu treffen. Einige von uns sind auf dieser Ebene neu, daher wird von uns erwartet, dass wir sie als Training und Entwicklung nutzen werden.